Loads in the luggage compartment should be safely secured. Heavy items should be placed as far forwards as possible. – Distribute the weight as evenly as possible. – Position heavy items as far forward as possible ⇒ fig. 82. 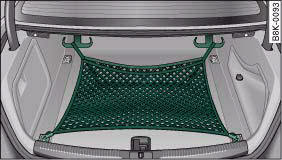 – Secure the load with the luggage net* or with non-elastic straps secured to the fastening rings*. 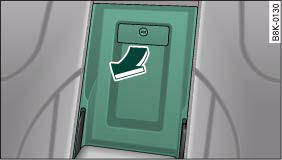 • Unsecured objects in the luggage compartment can suddenly shift and cause changes in the handling of the vehicle. • In an accident or a sudden manoeuvre, loose objects in the passenger compartment can be flung forward and possibly injure vehicle occupants. • Always store objects in the luggage compartment and secure with suitable straps. This is especially important for heavy objects. • When you transport heavy objects, always keep in mind that a change of the centre of gravity can also cause changes in vehicle handling. • Please observe the important safety warnings, “Safe driving”. Adjust the tyre pressure to match the vehicle loading - the correct pressures are specified on the sticker on the end face of the driver's door. There are four fastening rings in the luggage compartment which can be used to secure loads. – Use the fastening rings to secure the load ⇒ fig. 83 -arrows-. – Please refer to the safety notes. 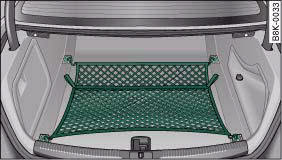 The stretch net / retaining net can be used to secure light items in the luggage compartment. – First secure the front hooks in the fastening rings ⇒ fig. 84. – Then secure the rear hooks in the fastening rings. – Secure the hooks of the retaining net to the fastening rings at the bottom of the tail panel ⇒ fig. 85. – Pull down the retaining hooks at the top of the luggage compartment. Pull up the net and attach the loops of the net to the retaining hooks. You can also use the retaining hooks ⇒ fig. 85 to secure light items of luggage, such as shopping bags, etc. The hooks will fold up again by themselves when not in use. The retaining net should only be used to hold objects weighing up to 5 kg. Heavier objects cannot be safely secured (injury risk). 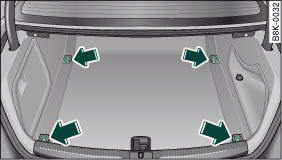 The DVD player for the navigation system* is located in the left side compartment in the luggage compartment. – To open the storage compartment, pull the handle, fig. 86. 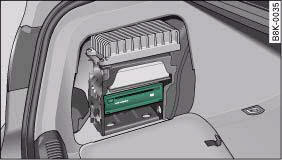 The DVD player for the navigation system is located in this storage compartment ⇒ fig. 87 in the luggage compartment. 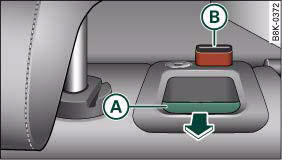 For more information, please refer to the Infotainment/MMI Operating Manual. The two sections of the backrest can be folded forwards either together or separately to increase the capacity of the luggage compartment. 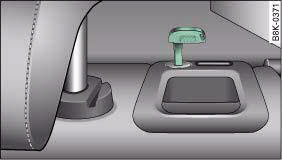 – Press the release lever A ⇒ fig. 88 in the direction indicated (arrow). – Fold down the backrest. – Push the backrest up until it engages securely ⇒ . The red marking on the tab B should no longer be visible when the backrest is properly secured. When the backrest is properly engaged in its upright position, it can be locked and unlocked with the key ⇒ fig. 89. 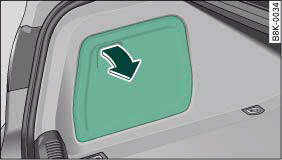 This prevents unauthorised access to the luggage compartment from inside the vehicle. • Make sure that the rear backrest is securely locked in position so that the seat belt can provide proper protection on the centre rear seat. • The rear backrest must always be securely latched so that objects stored in the luggage compartment will not fly forward during sudden braking. When returning the backrest to an upright position, make sure that the seat belts for the outer rear seats are in their guides so that they cannot be caught up and damaged in the catches for the backrest. You can use the load-through hatch and the removable ski bag to transport skis or other extra-long objects safely inside the vehicle without soiling or damaging the upholstery. 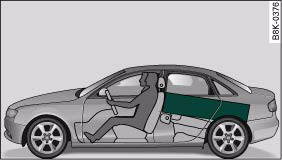 – In the passenger compartment, pull down the centre rear armrest. – You will then see the inside cover of the load-through hatch - pull the release catch downwards ⇒ fig. 90 -arrow- to fold the hatch down. – Open out the ski bag and fill it with the items you wish to transport. 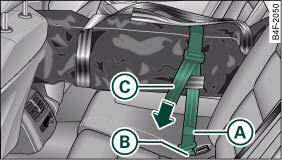 – Push the ski bag from the luggage compartment into the passenger compartment through the opening in the backrest ⇒ . – Insert the fastening belt A, fig. 91 of the ski bag into the centre seat belt buckle B. – Pull the free end of belt C to tighten. – Pull the ski bag towards the rear through the opening in the backrest. – Close the cover of the load-through hatch in the passenger compartment. – Fold up the ski bag. The ski bag must be secured in place with the fastening belt after it has been loaded. Allow the ski bag to dry before folding it up.